(Nanowerk News) For more than ten years, the H.E.S.S. observatory in Namibia has been mapping the centre of our galaxy in very-high-energy gamma rays. These gamma rays are produced by cosmic rays from the innermost region of the Galaxy. A detailed analysis of the latest data reveals for the first time a source of this cosmic radiation at petaelectronvolt energies: the supermassive black hole at the centre of the Milky Way (Nature, "Acceleration of Petaelectronvolt protons in the Galactic Centre"). The Earth is constantly bombarded by high energy particles (protons, electrons and atomic nuclei) of cosmic origin, particles that comprise the so-called “cosmic radiation”. These “cosmic rays” are electrically charged, and are hence strongly deflected by the interstellar magnetic fields that pervade our galaxy. Their path through the cosmos is randomised by these deflections, making it impossible to directly identify the astrophysical sources responsible for their production. Thus, since more than a century, the origin of the cosmic rays remains one of the most enduring mysteries of science. Fortunately, cosmic rays interact with light and gas in the neighbourhood of their sources and thus produce gamma rays. These gamma rays travel in straight lines, undeflected by magnetic fields, and can therefore be traced back to their origin. When a very-high-energy gamma ray reaches the Earth, it interacts with a molecule in the upper atmosphere, producing a shower of secondary particles that emit a short pulse of “Cherenkov light”. By detecting these flashes of light using telescopes equipped with large mirrors, sensitive photo-detectors, and fast electronics, more than 100 sources of very-high-energy gamma rays have been identified over the past three decades. The H.E.S.S. 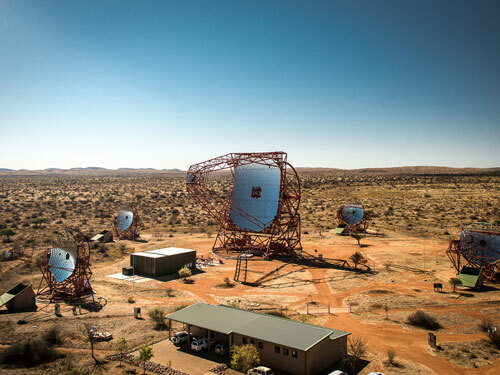 (High Energy Stereoscopic System) observatory in Namibia represents the latest generation of such telescope arrays. It is operated by scientists from 42 institutions in 12 countries, with major contributions by MPIK Heidelberg, Germany, and CEA, CNRS, France. Today we know that cosmic rays with energies up to approximately 100 teraelectronvolts (TeV) are produced in our Galaxy, by objects such as supernova remnants and pulsar wind nebulae. Theoretical arguments and direct measurements of cosmic rays reaching the Earth however indicate that the cosmic ray factories in our Galaxy should be able to provide particles at one petaelectronvolt (PeV) at least, 100 times higher than ever achieved by man. While many multi-TeV accelerators were discovered in recent years, so far the search for the sources of the highest energy Galactic cosmic rays remained unsuccessful. Detailed observations of the Galactic centre region, made by H.E.S.S. over the past ten years, and published today in the journal Nature, finally provide strong indications for such PeV cosmic-ray acceleration. During the first three years of observations, H.E.S.S. 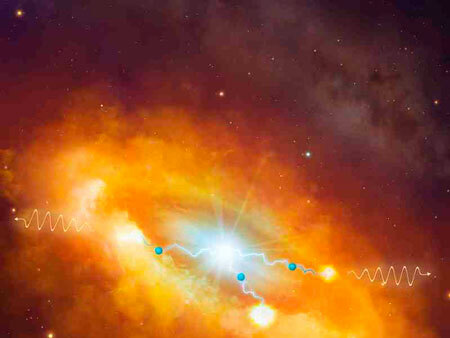 uncovered a very powerful point source of gamma rays in the galactic centre region, as well as diffuse gamma-ray emission from the giant molecular clouds that surround it in a region approximately 500 light years across. These molecular clouds are bombarded by cosmic rays moving at close to the speed of light, which produce gamma rays through their interactions with the clouds’ material. A remarkably good spatial coincidence between the observed gamma rays and the density of material in the clouds indicated the presence of one or more accelerators of cosmic rays in that region. However, the nature of the source remained a mystery. Deeper observations obtained by H.E.S.S. between 2004 and 2013 shed new light on the processes powering the cosmic rays in this region. According to Aion Viana (MPIK, Heidelberg), “the unprecedented amount of data and progress made in analysis methodologies enables us to measure simultaneously the spatial distribution and the energy of the cosmic rays.” With these unique measurements, the HESS scientists are for the first time able to pinpoint the source of these particles: “In the centre of the Milky Way there is an astrophysical source capable of accelerating protons to energies of about one petaelectronvolt, continuously for at least 1,000 years”, says Emmanuel Moulin (CEA, Saclay). This would be the first “Pevatron” ever observed. “With H.E.S.S. we are now able to trace the propagation of PeV protons in the central region of the galaxy”, adds Stefano Gabici (CNRS, Paris). The centre of our Galaxy is home to many objects capable of producing cosmic rays of high energy, including, in particular, a supernova remnant, a pulsar wind nebula, and a compact cluster of massive stars. However, “the supermassive black hole located at the centre of the Galaxy, called Sgr A*, is the most plausible source of the PeV protons”, says Felix Aharonian (MPIK, Heidelberg and DIAS, Dublin), adding that, “several possible acceleration regions can be considered, either in the immediate vicinity of the black hole, or further away, where a fraction of the material falling into the black hole is ejected back into the environment, thereby initiating the acceleration of particles“. The H.E.S.S. measurement of the energy spectrum of the gamma-ray emission can be used to infer the spectrum of the protons that have been accelerated by the central black hole – revealing that Sgr A* is very likely accelerating protons to PeV energies. Currently, these protons cannot account for the total flux of cosmic rays detected at the Earth. “If, however, our central black hole was more active in the past”, the scientists argue, “then it could indeed be responsible for the bulk of today’s Galactic cosmic rays that are observed at the Earth”. If true, this would dramatically influence the century old debate concerning the origin of these enigmatic particles. These extreme accelerators, until now only hypothetical, have been dubbed “Pevatron” in analogy to the “Tevatron” human-built accelerator.